I agree with the reviewer’s assessment. I bought the SimplyGo and love its portability. But it is indeed heavy, especially when out and about for the day when one must carry not only the unit but three other batteries and the electric cord with its transformer. Also, after a year’s use, I find the batteries don’t last anything like their stated times. In fact, they now last about half that. We purchased a Simply Go a year ago. It is loud. Could not take it to church or movies. The battery chargers get very hot. I would be afraid to use it while sleeping. Jan, that is not normal for the SimplyGo. It sounds as if the motor is not functioning properly, thus drawing more current that it should. The unit needs repair and the company from which you purchased the unit should assist you with getting the necessary repairs. If they are not cooperating, I recommend you contact Respironics directly at 800-345-6443 and tell them your experience. They should direct you to an authorized dealer that will assist you. I have called Respironics several times. Everyone I talk to says to call the dealer back. The dealer, of course, says the battery charger is only under warranty for 90 days. I started talking with them about this last year right after we bought it. So now they have sent a shipping tag and we have sent it to Atlanta to be analyzed. I have to pay shipping back from the company I bought it from however. Too bad. “couldn’t reproduce the problem.” I have phoned the Respironics number you list several times over the past year. They always tell me to call my dealer. So guess we are stuck with a doorstop. Jan, did you return the whole unit, or just the AC adapter? I would ask them for the official report from Respironics to verify what issue was reported and tested. Other than requiring that you go through a dealer (just like a car manufacturer requires you to go to a dealer for auto repairs), Respironics is one of the most helpful companies with regard to their repair department. And while $45 is a bit high for shipping, it is normal for dealers to charge for shipping. However, you should have been informed of this by the dealer when you purchased the equipment. I would not suggest simplego for oxygen dependent who litter flow is 5 and higher when walking, because the setting is set by the machine not by the patience breath that they take, therefore leaving them without oxygen during critical moments and then there’s a warm up period even after it skip a flow, yes that same warmup you have to tolerate when you turn on the machine. Also the volume is too soft and the pulse is to slow. I am still part of the working class 10 hour a day pushing wheelchair, lifting and changing grown men diapher at a high school I am a teacher assistance in the special education program. Thank you for providing your personal experience with the SimplyGo. Indeed, the SimplyGo is not able to handle the higher pulse flow settings when your breathing rate increases to above 20 breaths per minute. It is possible to out-breathe the machine, meaning you are breathing faster than the machine is able to produce oxygen. This is rarely an issue at lower pulse settings, but as you have experienced, it is a concern at higher flow settings. If a higher capacity of oxygen is needed, then a SeQual Eclipse 5 would be the best choice. Allison : My serviceman for the SimplyGo says the pulse flow setting represents a 3L flow on 3 but i have argued that it only represents the bolus flow in ml. Who is correct? Setting 3 is a rough equivalent of the liter flow and most people use the same pulse setting as they would continuous flow setting, which is most likely why your serviceman said it was the same. However, you are correct, the pulse flow setting 3 actually represents a particular bolus size in mL. This bolus size varies from one POC to another, with the SeQual Eclipse and eQuinox having the highest mL at each pulse setting using a 3:1 conserving ratio, while the SimplyGo provides less using a 4:1 conserving ratio. Of course, it gets even more complicated when you factor in the delivery method, which is why I wrote a guide to understanding pulse flow settings. Ultimately, a pulse oximeter is needed to determine which pulse setting is needed to achieve a desired blood oxygen saturation level. The car charger for the simply go gets very hot when in use. I have swapped out poc and chargers, but it still gets hot. Is it trying to pull too much power from the outlet in the car? Owner’s manual says it needs 13-19 volts for dc/ car battery is 12 volts. Is it dangerous to run this unit in the car? I find it hard to believe that respironics would make a poc that requires more voltage than a car can put out. It is normal for a DC adapter to get warm, but it should not be too hot to be touched. I recommend that you contact Respironics technical support for assistance. You can reach them at 800-345-6443. The price of the replacement batteries has almost doubled in the past years. No improvements. Still a miserly 90 day warranty, now for a unit which costs at least $200. We have a battery still functioning but the charge lights have failed. No sympathy from SimplyGo or the retailer. BTW the batteries are manufactured in Asia, not the USA as touted in ads promoting the SimplyGo. The unit itself is very reliable. Thank you for your sharing your experience. Batteries for portable oxygen concentrators are more expensive than most people realize, ranging from $200 to $500. The SimplyGo batteries are actually at the lower end of the price spectrum; however, the 90-day warranty is shorter than many other manufacturers who offer a 1-year warranty. Fortunately, batteries are usually pretty reliable and most people do not experience an issue with their batteries prematurely. Lithium ion batteries general last about 3 years before noticeable decline in capacity. Has anyone had any problems with your car charger for Simply Ho blowing your fuses in the cigarette lighter? Hi, not blowing fuses but inconsistent charging of the unit. Might even need to install a dual battery system on my car to get it to work. The charger makes a beep that is not in the manual and it keeps going, then stops, charges, stops etc. I know what you’re talking about I think. That occurs frequently for me on DC and AC power. I think it is when the power to charge the battery dips/cuts out then it beeps 3 times when the unit starts to recharge again. In my case it can occur when I am breathing a little harder so the unit is trying to draw power to run the unit and power to recharge at the same time. If that makes sense. I find the number of alarms this unit has really annoying too, and wish the silence button would just keep the alarm silent and stop resetting. It is forever beeping at me. It’s a beeping world it would seem. Plug the charger into the car first and then plug into the concentrator after the green light is on. It seems there is a surge that blows car fuses if the car adapter is hooked to the concentrator before plugging into the car. We went through a few fuses until we changed to this method. I have owned a SimplyGo portable concentrator for 3 years and I think I have experienced all of the problems above and more. On the whole this machine has some pluses but also some terrible fails. I have recently experienced the car fuse problem taking out both the auxiliary DC outlets in my car. I replaced the DC cord and auto electrician replaced the fuses. Since then I am no longer able to use the machine on DC power on 2 litre continuous flow. Fuses don’t blow but machine de faults to 1.0 continuous flow. Have not received any valid response from Respironics dealer except to send for a service. $300 minimum charge as starters. The most frustrating and limiting problem I have had is with the battery life. It comes no where near the suggested time rates when using in a controlled BPM situation on designated settings for projected times. Long ago I gave up complaining regarding this which I believe turns the SimplyGo into Simply don’t Go too far or for too long. I have 4 batteries but on 2 litre/ min with 20 BPM I am lucky to get an hour out of each battery. If I can assure to be able to plug into AC power then it is ok, otherwise too unreliable for longer outings. I believe the rates stated are misleading. I have used other brands of portable devices and they have performed closer to the mark. I don’t believe with this product you are getting what you think by the listed specs. Buyer beware. I believe that although it was innovative to produce a portable unit with a continuous flow setting, the poor little machine is not quite up to the task and after 3 years use I may well have outlasted the product. Well done me and Philips, keep your researchers working on the next generation concentrators. Not quite there yet. Thank you for sharing your experience. The batteries last only 50 minutes on 2 LPM continuous, but should last about 3 1/2 hours on Pulse 2. Be sure you have the setting on pulse 2 for longer battery times. If you are indeed getting only an hour on pulse flow then there is something wrong with the unit. The motor may be running too hard and draining the batteries prematurely. I recommend service if this is the case. Thank you. Yes it is on pulse dose. It has been the case since purchase and although I complained no action was taken. It has been very disappointing as the other features of the unit have mostly been good. After 3 years of use it has become much more noisy with motor surges and sounds sick. Along with other problem mentioned above of no longer running on continuous 2 LPM on DC. Yes I will save some money and send it away when I can afford to be without it and find the money. Breathing can be expensive for those of us with lung disease. Treasure the air. Hello, I cannot get the car charger to charge the unit properly, It beeps and makes all different sounds, then charges for a bit then stops charging. Eventually the battery goes flat as the unit is not charging properly. This is with it plugged into the rear 12V outlet on my car which has a larger cable and fuse. In the front of the car the unit would not charge at all. Like the person above said is the operating range 13-19V and a car is 12 why would they even design the unit this way? Does anyone else have these issues? We have swapped the charger over once already.It restricts us on going on any long trip and defeats the purpose of having a poc in the first place. My unit will not run on continuos flow above 1.0 LPM on DC charge. It will run on pulse dose on DC charge however. The pulse dose settings draw less power. My machine does seem to struggle on the continous flow 2LPM. I understand your complaint. Having it recharge the units batteries and running off the DC while driving was a selling point for me too. I agree. Disappointing. The portable unit lights up and beeps 4 times every minute, How can I Stop it from beeping. Reads 2.o and is working ok. The next time it alarms, check the screen for the alarm symbol, which is located to the left of the battery. If it says NB, then it means no breath is detected. If it says O2, then it is a Low Oxygen Concentration Alarm and it would need service. You can check your User Manual starting on page 19 for a full list of alarm Indicators and Screen Symbols. Thanks for all the comments here, it is helpful to know. But I am curious if anyone has experienced what my father is observing now – he regularly set to continuous mode with 2PM, it was ok for the first few months, but then the machine started to behave this way: it automatically turned to 1PM with some beep, but it didn’t show any alarm sign. Some times I can set it back to 2PM, sometimes the buttons wouldn’t respond and I have to wait for 1-2 minutes or shut it down to reset it to 2PM. This started to happen more often now. I called up Philips and also the place I bought the machine, they didn’t know what is going on but sent me a new machine to try out. We got the new one, and tried out, but the same thing happened. Just wondering if any of you have this experience? Or any suggestion what might be causes? I’m sorry that I cannot be of help with regard to the issues you are having with your SimplyGo. The manufacturer would be your best source of information. Perhaps others reading hear can also provide some insight. Unfortunately, batteries cannot be repaired, so if they are truly dead then they would have to be replaced. Before you give up, I recommend that you recalibrate them. You can do so using the SimplyGo Desktop Battery Charger. Same frustrating problem. Blows car battery fuse on DC after a few minutes even when using Pulse 1.5. Incredible that there was not more planning by the designers! That issue is not common with the SimplyGo, especially on the pulse settings. You may want to try it in another vehicle to see if the vehicle is source of the problem. I suspect, though, that the there may be something wrong with your DC adapter. I recommend contacting your provider about getting a replacement DC adapter. My unit will not go over 1.5 for nighttime continuous flow. On 2lpm it beeps continuously. Help. When you unit beeps the display screen will indicate the problem. You can check the symbols on the display against the ones shown in your manual beginning on page 19. Your unit is probably unable to maintain the purity at 2 LPM and is giving a low purity alarm. I recommend contacting your provider for service. well my new one isn’t working right either, the pule setting isn’t pulsing when I breath, it pulses after I breath or when I am breathing out any way I can fix this? You would first want to check your cannula to make sure it is not obstructed or more than 30 ft. long. If you continue to have an issue, then I suspect there is an issue with the unit and it would require manufacturer repair. Since the unit is new, your provider should be able to make arrangements for warranty repair. MY question is would Simply GO be good for me if I take a flight from Kolkata to New York.which include a 4 hr flight to QATAR and after a 2 hr break, a 16 hr flight to JFK. QATAR airlines says that they will provide inflight oxygen of 2 or 4L/min as per Doctors prescription. But during waiting periods at he airport in KOlkata and QATAR while changing planes , will simply go serve my purpose safely? Yes, the SimplyGo will meet your needs as long as you have access to an electrical outlet. While the unit does work on battery power, each battery will last only 50 minutes on 2 LPM continuous, requiring a lot of batteries to provide the oxygen you need. If you can use pulse flow, then the batteries last much longer (3 1/2 hours on pulse 2). I got my mother one of these 2 1/2 years ago. The most she ever got on battery at 2 lpm was 40 minutes. We are now lucky to get 20-25 minutes per battery, including the new ones we bought last year. The machine does make a loud noise which has kept her from church. The recalibration/external charger does work. There are definitely issues with the car charger and overheating. My guess, after years working with lasers and medical equipment, is that the injected insulating material in the transformer is not particularly good. If we are going to plug in to the auto, especially for a long trip, I make sure that there is a fully charged battery in the machine. It does not seem to draw as much current to top it off, and spares the overheating and beeping. Anything below 2/3 of a battery does overheat and will not charge. Thanks but please let me know if the Simply go can be used overnight with my Phillips CPAP machine with an electrical outlet at home using a cannula in the nose covered by full face amara face mask from the CPAP machine . 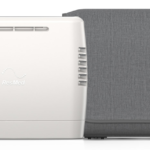 The SimplyGo has a continuous flow setting so it can be used with a CPAP machine. However, it is not usually used with the cannula covered by the face mask. Usually, the oxygen is bled into the CPAP mask tubing using an Oxygen/Pressure Adapter for CPAP. I am a neibour of a patient that has a SimplyGo unit as a Power BackUp Unit for in home use during power outages. It will be very seldom used as a portable moblile unit in case of an emergency only. My question to you is whether or not it is acceptable to leave the unit pluged in an AC receptical in the home all the time so that the battery will stay 100% charged ready to use when there is a power outage? That is the primary use for which this unit is used. Also just a quick comment for those questioning the vehicle DC Power, the SimplyGo unit is not designed to run on Vehicle Battery Power which is roughly 12.5 V DC, but rather on 13 to 19 V DC which is only supplied when the vehicle engine is running. Also some newer vehicles today have an Auxillary Plug for accessories such as SimplyGo which draws more power than the standard Cigarette Lighter Plug is capable of handling. People should check there vehicle owner’s information to make sure that they are using an acceptable Power Plug. P.S. Your site is an excellent souce of information Thank You. I am not aware of any issue caused by leaving a unit plugged into AC; however, if you like you can get confirmation directly from the manufacturer by calling their technical service department at 800-345-6443. Also, since the unit is seldom used, please note that it is best for the unit to be used and the battery to be drained fully at least once a month. This will prolong the life of the unit and the batteries. If the unit is not used, the sieve material settles to the bottom and will eventually not allow the unit to produce the required oxygen purity. I have been given a simply go from my provider six months ago and I have been using only on and off. I am planning to take it on the plane for my travel next month and was shocked to find out that on the pulse mode level 2 setting the battery hardly lasts for 30 minutes against the 3 hours mentioned in the manual. I am extremely disappointed as I have hardly used this machine for more than 6 times during the last six months .. If the battery is lasting only 30 minutes on setting PULSE (be sure you haven’t chosen the continuous flow option), then either the battery or the machine is faulty. I recommend you contact your provider for warranty service. Can I use SimplyGo all day long from 08:00 am to 08:00 pm. The device can work so long per day without tecnical problems. Yes, you should have no trouble using the SimplyGo 12 hours per day. My company that provides me air tanks, came out yesterday,picked up the tanks and the hosed base unit and gave me a Philips SimplyGo portable unit in their place! I’m new at using the unit, but I’m very happy not to have to drag those tanks around anymore! The Philips unit seems to work well for me, its not very noisly,and easy to transport around, I’m not sure on the battery life…but it sure beast the hell out of those tanks! Unfortunately, no. While the batteries are manufactured by the same company, the electronics in them make them incompatible with any other unit so SimplyGo and EverGo batteries are not interchangeable. I have a problem with simplygo machine. The triangle code keep appearing and I have checked to make sure there is no blockage of air to the unit. What else could cause this. There is something wrong internally, possibly with the compressor, but the unit would have to be serviced to determine the cause and the repair necessary. I recommend you contact your provider for assistance. I am not a provider or manufacturer of oxygen equipment. I recommend you contact your dealer for warranty repairs. For assistance from Respironics, you can reach them at 800-345-6443. Allison I have sent mine back at a considerable out of pocket price. They sent me back a dirty unit. In addition my unit now blows fuses in my truck. The batteries last less than 30 minutes. Now it makes weird noises and can only be used while plugged in to AC outlet. 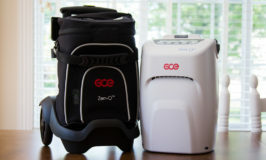 I have been looking for reviews on the Respironics Simply Go Mini Portable Oxygen Concentrator, but have not found any. Can anyone provided some information on how reliable this concentrator may be? oxygen flow until my wife feel faint. You can then turn off the machine , restart it an it is working again. the limited battery life, the car charger is essential. Do you have a similar problem at home using the AC adapter? If not, it could be an issue with the DC outlet in your car. To assure your wife is getting her oxygen using the DC adapter in the car, try using the unit in the car without the battery. Then when you reach your destination, turn off the unit to load the batteries and then turn it back on. I have simply go oxygen concentrator that I bought in 2015. It had been giving a “∆” alarm for past 2 months and I have been trying to get it repaired in India (Bangalore). But it has disappointed me. The service center in Bangalore seems very incompetent to even know the fault in the machine. They kept my machine for 10 days ( without giving any back up. I had to take a back up machine on rent). But even after keeping it for so long, they could not find the problem and kept telling me that the spare is not available. When I insisted on having my machine back, they gave it back but the machine had stopped working completely. I am not even able to switch it on. When enquired with the service center, they say the machine stopped because they opened the machine. I don’t feel justified with the money I have paid for this machine. I am sorry you are having such trouble in getting repairs for your unit. The alarm code you were getting is the technical fault alarm and in the U.S., it is usually serviced to replace the sieve (where the oxygen is made in the unit) and the compressor. I have a Philips Simply Go that was bought second hand from a deceased estate. I was assured it had had very little use. I use this machine only occasionally as I only need it when travelling. At home I have a larger machine supplied by the Queensland health department. The last time I used this machine it played up and stopped working in the continuous supply mode. I was 1000 miles from home and fortunately found a local Oxygen Machine supplier and sought his advice. This gentleman rubbished Philips to such an extent I believed they had murdered his firstborn and took his invective with a dose of salt. HOW WRONG I WAS! I rang Philips at their Melbourne Depot (I am in Australia) and they all but refused to talk to me. All I wanted to know was where I could get it repaired. They told me to take it to my selling dealer. When told I had bought it second hand they all but hung up on me. Ringing other outlets got the same results. You didn’t buy it from us you are on your own. I hasten to point out at no time did I ask for warranty or indicate in any way that I was seeking anything other than a paid repair. Eventually my local Air Liquide Health representative’s advice was sought and he was able to inform me that he could help with getting the Simply Go repaired. WHAT A BREATH OF FRESH AIR AT LAST! CONGRATULATIONS ALH. And thanks Wayne. Wayne explained that the machine had to go to Sydney for repair and that I would be supplied with a quote and could then make an informed decision as whether to repair it or not. I would also be responsible for freight costs to and from Sydney. I was more than happy with this. Then the excreta hit the propeller as the saying goes. PHILIPS BECAME INVOLVED! THEY WOULD NOT ISSUE A FIRM QUOTE UNTIL THE JOB WAS COMPLETE! WHAT A PACK OF IGNORANT ARROGANT INCOMPETENTS THESE PEOPLE ARE. THE BEST I COULD GET WAS “WORST CASE IS $2000” ALMOST HALF THE PRICE OF A REPLACEMENT UNIT. The unit was repaired and returned at a cost of $1216.23 over 24% of the cost of a new unit. My prescription is for 12 hours per day. 280 hours equates to 23.3 days of use which equates to $52.12 a day to stay alive the Philips Simply Go way. I would suggest that Philips should be the subject of a health department enquiry. They are purporting to supply a life support system at no small cost which seems to fail at a fairly high rate putting users at risk. Philips has a monopoly on this form of oxygen concentrator as far as I can discover so I suppose that this is why they are able to price gouge in this manner. This monopoly does not however give them the right to treat the end user like something trekked in on the bottom of your shoe. Bought for my wife to use overnight when visiting grandchildren and short overnight vacations. Nothing but problems since we purchased and used very little.